The Stevens Institute of Technology community came together on November 4, 2015 to congratulate the Stevens team on its momentous achievement in earning first place at the 2015 U.S. Department of Energy Solar Decathlon. After more than a week of fierce competition at Orange County Great Park in Irvine, California this past October, a panel of judges crowned Stevens’ competition house – SURE HOUSE – the most energy-efficient solar home among the 14 homes competing for the title. In designing and constructing SURE HOUSE, a multi-disciplinary team of more than 30 Stevens students, under the direct supervision of faculty, drew inspiration from Hurricane Sandy to build a net-zero energy home that was resilient enough to withstand hurricane-force winds and flooding. Stevens President Nariman Farvardin expressed his delight at the stellar turnout by faculty, staff, students, alumni, friends and Hoboken residents who packed the Walker Gym on Stevens campus to celebrate SURE HOUSE’s victory. In his opening remarks, Farvardin congratulated the “smart, disciplined and determined” individuals of the Stevens Solar Decathlon team. The biennial competition has been near and dear to Farvardin long before he assumed the helm of Stevens, going back to his days at the University of Maryland. To say that he was “pleased” by this accomplishment is an understatement, said Farvardin, who recalled many sleepless nights resulting from closely monitoring scores throughout the eight days of competition. Farvardin, who was at the competition in Irvine on October 17 when Stevens was declared the winner, described the day as “one of the most exciting and rewarding experiences” of his life. John Nastasi, lead faculty for the Solar Decathlon project and director of Stevens' Product-Architecture & Engineering program, was effusive in his praise of the support given to the two-year project by President Farvardin, the Stevens Board of Trustees and the entire university community. Nastasi also recognized the contributions of Project Manager Ed May and Chris Steffens, a faculty member on the project. Together, the trio has worked together on a Solar Decathon project for six years, beginning with Stevens’ 2013 competition house Ecohabit, which took second place in architecture and fourth place overall. 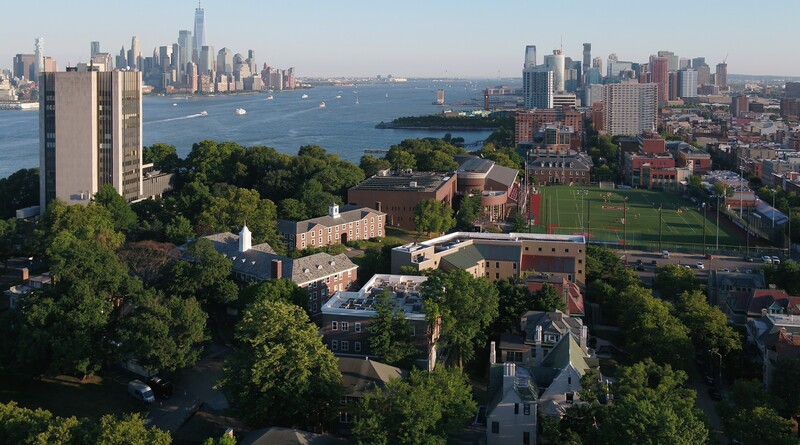 Hoboken Mayor Dawn Zimmer, who has been on hand to mark every major milestone of the SURE HOUSE project, expressed how “incredibly proud” she was of the achievement by Stevens students and faculty. As the mayor of a city that is “on the front lines of climate change,” Zimmer underscored the far-reaching impact of their work. President Farvardin reminded the audience that Stevens’ participation in the Solar Decathlon was no small undertaking, saying sponsorship was critical to the Stevens team’s success. In so doing, he presented a plaque to Ellen Lambert, president of the PSEG Foundation, in recognition of PSEG’s significant contribution as the largest sponsor of SURE HOUSE. Still basking in the glow of their win, students and faculty who comprise the Stevens Solar Decathlon team shared their exhilaration at the celebratory gathering. Steffens described winning as a “deep emotional release,” saying that anything other than a first place finish would have been a disappointment for the students. Chris Hamm, a graduate student in the Stevens product architecture and engineering program and construction manager for the SURE HOUSE team, described the unique learning opportunity that comes with participating in Solar Decathlon as a process that truly prepares students for career success. “I can’t imagine anything quite like this experience,” said Hamm. A.J. Elliott, also a product architecture & engineering graduate student, voiced a similar observation. Although his background is in electrical engineering, Elliott served as the public relations manager for the SURE HOUSE team. Top: SURE HOUSE team members gather to cut the the congratulatory cake. Right: SURE HOUSE member displays a t-shirt that was presented to all team members. Left: Hoboken Mayor Dawn Zimmer and Stevens President Nariman Farvardin. Bottom: Close-up of congratulatory cake.